A key question when exploring the project of public governance through law is: what role can and should citizens play in the endeavour? We examined this question in the context of universities, by exploring how students participate in the formal and informal governance of universities. In other words, we began by thinking about the role that students play in creating law—both in a formal and explicit way, as well as an informal and implicit manner. I assigned the first reading in order to get students reflecting on the theme of civic engagement and the second to analyze purported barriers to student involvement in shaping how universities function and therefore how they experience their third-level education. We began class with a brainstorming exercise on all of the different ways students can participate in the governance of university—from holding an official position on the executive of the student union, simply voting in student elections, engaging in sit-ins, boycotts, protests etc. Next, we explored some accounts of the purposes universities ought to serve: ought they to be strictly economic or are they in fact primarily ethical enterprises? Why or why not do students see themselves implicated in the public mission of university? • Thomas McMorrow, Natalie Oman & Rachel Ariss, “Indigenous studies is central to liberal arts education in Canada” Ottawa Citizen (21 December 2015), online: http://ottawacitizen.com/opinion/columnists/op-ed-indigenous-studies-is-central-to-liberal-arts-education-in-canada. Students were asked to write a reflection on their experiences of the panel and/or create a short video reflecting on themes explored that day. Also, one of the questions on the final exam asked students to write a memo outlining what they thought universities can and should do in order to foster reconciliation. Thus, students had an opportunity to express their thoughts and feelings about the panel themes, while at the same time demonstrate their critical analysis of the concepts and proposals in the literature. 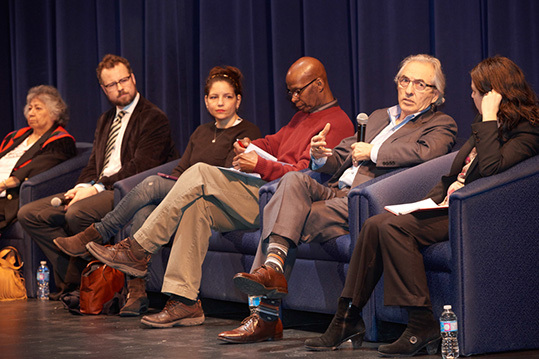 Rich with diverse identities and experiences, the panel appeared to capture the interest of all the students who attended (45/49)—or at least, so they said in their reflections. The backgrounds of the panelists are indicative of the complex, nuanced and fascinating conversation that unfolded. For instance, Carl James is a professor of education, former Affirmative Action Officer at York and an African-Canadian born in the Caribbean. Phil Fontaine was the longest serving National Chief of the AFN, and is an Ojibway from the Sagkeeng First Nation in Manitoba. A residential school survivor, he was credited by the TRC for speaking publicly about his experience of sexual abuse in residential school thereby pushing the need to address their effects onto the national agenda. President Tim McTiernan, an Irishman, is the University’s President and at once, a government negotiator on Indigenous land claims in the Yukon. Shirley Williams was the first person promoted to the rank of professor at Trent University on the basis of Indigenous knowledge. Hailing from the Wikwemikong reserve on Manitoulin Island, the Obijwa elder also survived residential school. Psychologist and education scholar, Suzanne Stewart is from a Dene family whom she noted has been deeply affected by the trauma of the residential school system. Natalie Oman, a professor of Legal Studies at the UOIT, who hails from a settler family in rural Ontario, has done extensive fieldwork with the Wetsuweten and Gixtsan First Nations in British Columbia. McGill law professor Kirsten Anker is an Australian, married to a Frenchman, raising her children in Quebec while exploring Indigenous ways of conceiving and living property and legal pluralism. Kelly LaRocca is a former civil litigator, Chief of the Mississaugas of Scugog Island First Nation and sometime lecturer at Sir Sanford Fleming College. Seasoned speakers with interesting stories offered good fodder for student reflection and discussion. The following class- some days before the reflections were due—we did a debrief on the panel and attempted to draw connections between that discussion and the ones we had about universities in general and the role of students in shaping them. [D]ue to the accountability deficit, the Federal Government needs to take leadership on nationally redressing the harms experienced by indigenous persons and that this needs to be done through consultation with indigenous persons. It is not enough to make a change in one area of law or society, for a change to be lasting it needs to be normalised into every area of public life. Education is one area that would benefit from reform so that correct knowledge is disseminated to raise attention, understanding and compassion to the situation of Canadian indigenous peoples. Reconciliation efforts need to be carefully analyzed so that these initiatives are not a more insidious form of colonialism and that education on and education of indigenous peoples is not further complicit in culture stripping and identity loss. It should be noted that this particular student was also taking a research-based course on atrocity crimes against Indigenous peoples in Latin America. Designed and led by Natalie Oman, the student research informs her project (and forthcoming report) for the United Nations on this subject. An outstanding example of the integration of research, teaching and public service related to Indigenous issues, if ever there was one. I hesitate to dismiss the role of university as a mechanism for reconciliation, but believe it must use its cultural capital only in such a manner as to legitimate devolution of political power. The discretion over the degree to which western institutions actively insert themselves into the process of reconciliation, represents the fundamental challenge for the balancing of social interests. It may equally represent the moment at which western institutions are forced themselves to evolve as an articulation of contemporary knowledge systems and culture. But this decision I leave to those on whose behalf such a change would be designed to benefit. The sad reality of my upbringing has personally embarrassed me today because of the manner in which I can relate to the stereotypes expressed by Shirley Williams. Many people scoff and righteously reject the idea that these stereotypes exist within Canada, but the truth is they do and for many of us are attempted to be woven into our sub-consciousness from a young age. I was not taught to physically mistreat or abuse indigenous peoples, but I was not taught to respect them. I was informed that they were drunks who chose to live off welfare rather than work for a fair wage. Indigenous people were not proud people, they were a primitive culture attempting to usurp our new wave westernized philosophies. I had been always reminded that historically Canada did nothing wrong, and that the indigenous tribes were merely attempting to extort more land out of the government in order to establish a lost art, a lost culture. Now, couple this mindset with the lack of education taught in schools concerning indigenous history and it creates a foundation built on ignorance and misinformation. 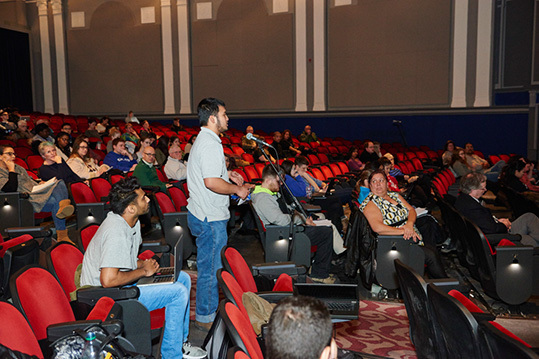 “After attending this presentation I have come to regret my previous course selections. At the beginning of my year at the University Of Ontario Institute Of Technology, I spent two years essentially studying introductory courses. After those were completed I was able to narrow my studying, focus my selections around topic areas I found interesting and that coincided with the area of law I was interested in going into. Unfortunately, with my lack of knowledge and background into aboriginal studies I took few courses concerning this topic area and spent very little time absorbing new information. I regret this wholeheartedly now, which is why I respectfully agree with both Kelly Laroc [sic] and Dr. Susan Stuart’s [sic] suggestion of creating a mandatory indigenous studies course. I do not believe that teachers and professors are aware of the lack of appropriate knowledge being administered to their students. This is why the idea around universities becoming a part of the reconciliation process for the indigenous communities of Canada is so important. Students need to be properly engaged and informed of the real history of Canada in order to make even the slightest attempt to reconcile with indigenous societies. Another reflection in particular evinced much less distance from and perspective on the embodiment of colonialist attitudes. Being able to read these reflections informed how I framed class discussion. Also, as I mentioned, students had the option to create three minute videos reflecting on the themes covered in the two classes on student participation in universities and the role of universities in reconciliation. I created this option for students who were unable to attend the #TRUR event (although could view its recording after the fact) or who preferred to express themselves in this medium. I encouraged students to do both and said they’d receive whichever grade was higher. Hardly any took on both. And few took advantage of the invitation to be as creative as possible in designing and producing their videos. Most simply recorded themselves speaking. One, however, used an online animation program, so her narration of the history of residential schools and the implications of the TRC for universities today was alive with dynamic illustrations. I used this clip in our review in the last class. Student generated content, demonstrating student learning, can be a wonderful teaching tool. Finally, many of the recommendations and arguments expressed in their exam responses have informed my grasp of the question of how universities in Canada and the UOIT in particular can respond meaningfully to the TRC’s call to action. My grandmother, Jean Jones/Borrows, ran away from home so she would not have to attend residential school in Ontario. Her siblings did not run away, and were taken to residential school. My grandma still expresses guilt that she could not help her siblings. She says, “sometimes there are things in life you can’t get over, but I believe you can get through them”. From 1929-1975, an estimated 9,200 Indigenous children attended St. Michael’s Residential School in Alert Bay, BC. One week ago I watched a film by renowned director Barbara Cranmer (‘Namgis First Nation) entitled, Our Voice, Our Stories. It told Truth. It showed Reconciliation. 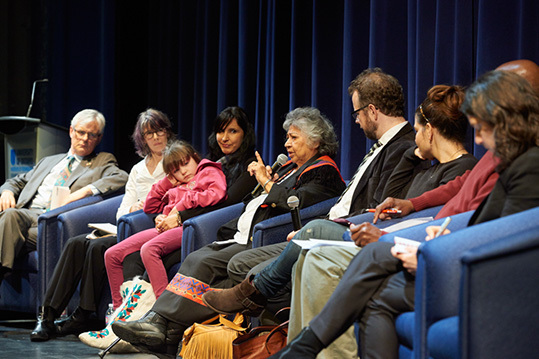 It illustrated Indigenous law in action—ceremony, mending harms, decision-makers coming together in deliberation, and the ongoing obligations to share stories. The film was a story of people tending to a wound that they might not get over, but that they are getting through. The film showed residential school survivors coming together along with their descendants and allies from across British Columbia to watch the demolition of St. Michael’s Residential School. It was inspiring to see people together again to continue their healing. One does not usually think of a demolition as a ceremony. For those who attended St. Michael’s Residential School, the school’s destruction was a form of emotional, intellectual, cultural and spiritual reconstruction. People wore button blankets, cedar woven hats, smudged with medicinal plants, sang, cried, embraced, told stories, and came together. The crumbling of the red brick school building lined with narrow rectangular windows stood in stark contrast to the strength of the people who participated in the ceremony. The sparkling blue ocean, surrounding forests and distant mountains also witnessed the ceremony. What stood out to me the most out of the dialogue in the film was a young girl who said she saw a little boy’s spirit leave the residential school during the demolition. She said he looked happy to be leaving. To hear that acknowledgement of freedom coming from such a young voice gave me shivers and hope. During the question and answer session filmmaker Cranmer said there are no plans yet as to what will replace the demolished school in that now empty space. While law schools will likely not physically build anything in that empty physical place, the spaces in people’s minds can be filled with knowledge and discussion about how to heal and learn moving forward. Barbara has not yet made any specific plans about teaching curriculum to share the film but she is very open to being contacted to allow people access to the film and to use it as a teaching resource. Her band office can be contacted. It is an informative and affective resource for bringing Our Voice to Our Stories.